One of the first thing Anglo settlers did when they got to the Panhandle was create a town in the northeast Panhandle near Sweetwater Creek. They called it Hidetown. No, wait. That's not exactly right. The people who set up the town weren't what we call settlers - they were buffalo hunters, down from Kansas, where the buffalo and, by extension, buffalo hunters were already a thing of the past. They were there for the buffalo, not the settling. And it wasn't really a town, either. It was a hunter's camp with affordable housing - buffalo hide shelters. Hidetown. A year later the U.S. Army established Fort Elliott a few miles from away, which offered some protection for the town and, along with the Texas Rangers, a measured dose of law and order. By then, the good people of Hidetown sought a more dignified name. They took to calling it Sweetwater, in honor of the creek that provided precious water in that arid land, but the U.S. Post Office already had a town by that name. George Montgomery, the town's first postmaster, decided to solve the dilemma by sending to Fort Elliott for an Indian scout to come to town and offer a tribal name. Or so the story goes. Two Indians showed up along with famous buffalo hunter Billy Dixon, who served as an interpreter. Mobeetie, they said, is the Indian word for Sweetwater. The townspeople were delighted. Mobeetie it was. Later, the townspeople learned that the Indians duped them. Mobeetie, according to the story, actually translates from English to "buffalo dung" in Cheyenne. Interesting, if true, as columnist L.M. Boyd liked to say. Maybe the Indians were psychic, because Mobeetie was as rank a place as any fancier of rankness could ever want. Gamblers, prostitutes and gunfighters turned Mobeetie from Hidetown into a frontier Sodom and Gomorra. Pioneer Panhandle cattleman Charles Goodnight described the town as "patronized by outlaws, thieves, cut-throats and buffalo hunters, with a large percentage of prostitutes." 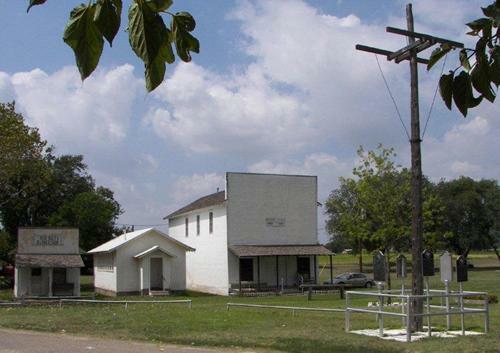 Temple Lea Houston, Sam Houston's youngest son, wrote his wife that Mobeetie was "a baldheaded whiskey town with few virtuous women." "Near the jail museum [in Mobeetie] are several buildings from Old Mobeetie along with a wooden flagpole, the last surviving remnant from Fort Elliott." Businesses of the day included such entrepreneurial shenanigans as the Pink Pussycat Paradise, the Buffalo Chip Mint and the Ringtown Saloon, a whorehouse that catered to black men - mostly the Buffalo Soldiers from Fort Elliott. Tourists and celebrities who visited the town included Billy the Kid, Wyatt Earp and Pat Garrett. Happy-go-lucky murderer Clay Allison lived just outside of town for a while, and even got married in Mobeetie. Bat Masterson, soon to be a Western legend his ownself, showed up with the buffalo hunters in Mobeetie (called Sweetwater at the time) in 1876. Dapper as any buffalo hunter could be, Bat frequented the Lady Gay Saloon and was reportedly sweet on a pretty dance hall girl named Mollie Brennan, but an ex-cavalry sergeant named Melvin King had his eye on Mollie, too. One night when the poker didn't turn out the way King had hoped, he found Bat and Mollie at the Lady Gay, being sweet to one another. King pulled his pistol and fired two shots. The first bullet from King's gun hit Bat in the hip, and caused him to walk with a limp for the rest of his life. The second one killed Mollie. Bat raised himself from the floor and fired one fatal shot at King. That's one version of the story, of which there are three. Robert K. DeArment, Bat Masterson's most reliable biographer, wrote of the incident, "We have only Bat's story, as retold by three other men, the details differing in each instance." At any rate, Bat took his broken heart and wounded hip to Dodge City and fame as a lawman, gunfighter and gambler. They buried Mollie in a cemetery outside of town. Mobeetie continued to rock along until around 1890, when Fort Elliott closed up shop. The saloons closed after a well-received revival meeting in 1893 resulted in some 300 conversions. A tornado destroyed most of the town and killed seven people in 1898. A controversial election in 1907 moved the county seat of Wheeler County from Mobeetie to the town of Wheeler. When the Santa Fe Railroad line from Pampa to Oklahoma missed Mobeetie by a couple of miles in 1929, the town packed up and moved the two miles north to New Mobeetie and stayed there, another once-thriving town with a great future behind it.